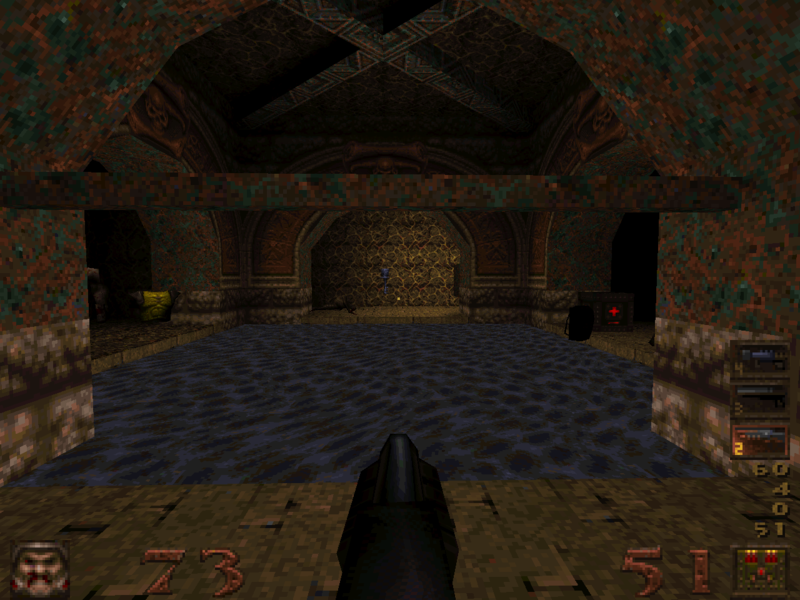 Screen shots from Quake, include two 640×480 TIFF’s. Here they are - at long last! The very first screens shots of Quake, taken at 320x200 resolution. Screens q15.tif and q16.tif are high-res 640x480 24-bit TIFF color screens, just so you can see the awesome lighting. The cool Quake lighting can be seen in all these screen shots (except the de1m5-? ones, which are DOOM screen shots) and a couple sprites and an Alias model as well. We don't have any Alias models working in the game at this point, but we're >this< close to getting them fully implemented with movement, proper light sourcing and animation. Screen q6.gif has our dragon hovering above a bridge above a moat. The screen shots prefixed by qe1m5 are to be compared against their DOOM counterparts, the screen shots prefixed by de1m5. Obviously, these are screens from DOOM episode 1, level 5. I duplicated the level and Quakeified it and you can see for yourself how cool it looks compared to the original.